The past two weeks have been incredibly eventful. Tomoe’s been becoming increasingly mobile. While she isn’t crawling yet, and probably won’t be for at least 2 or 3 months, she is slowly moving herself around on the floor, including making a full 360 over about 5 minutes. Not only is she doing pushups very well, but she’s been raising her bum in the air while on her knees. What a fascinating red thing. Tomoe’s been reaching for toys and other objects a lot these days. When she sees something she wants, she’ll try to reach for it. She’s also been manipulating things with both of her hands, and is getting better at controlling them with her hands. She’s now able to hold her bottle with her hands, but she doesn’t have a great amount of control. She has certain toys that she really enjoys playing with, including a Shimajiro toy (it’s a tiger) and a musical Winnie the Pooh. 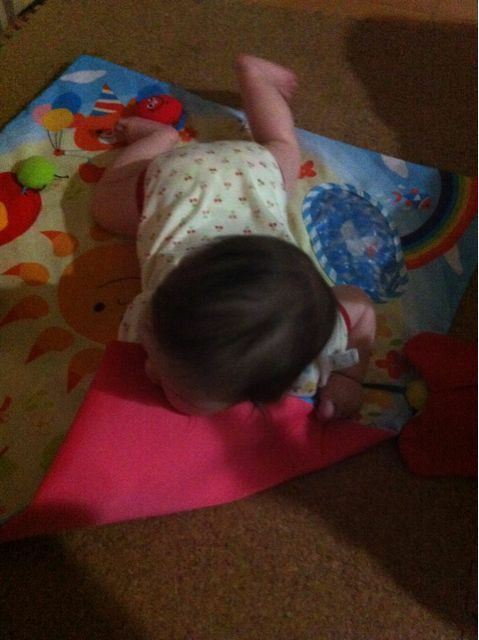 She really likes reflective surfaces, and she enjoys making lots of noise with her play mat. There’s a butterfly with a noisy plastic inside that she’ll play with for a long time. She’s also started eating solid food daily. Mainly, she’s been eating okayu, which is made of rice. She seems to love it! 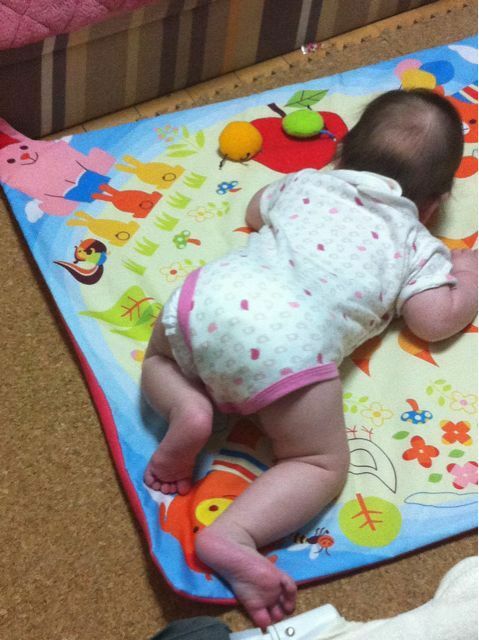 She’s still unable to sit unsupported, but she does use her hands to hold herself up. She’s becoming more upright while sitting, as well. However, she hasn’t been able to put herself in the sitting position yet. She’s been very vocal as usual, and her sounds are becoming more varied. She can pronounce all the main vowel sounds, as well as the letters m, b, n, w, and ng. One really big milestone is that she’s recognising her name now. When we say her name, she’ll look at us. It’s nice to know she understands it! This post is called the good and the bad for a reason. Now for the bad part. Last week, Tomoe developed a fever. However, this is completely normal, and it has to do with teething. But due to this, she had 3 somewhat sleepless nights. It was pretty sleepless for my wife and I. She cried most of the time and had a temperature of 38 degrees. It wasn’t a bad fever, but enough to make her uncomfortable. Even though she had a fever, she still played. 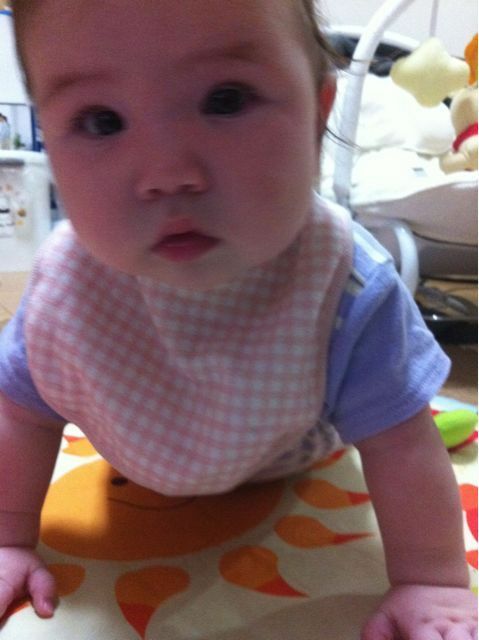 After her fever, she developed a bit of a rash, with lots of red spots on her skin. This is also quite normal, caused by the fever. Last Friday, she slept a lot! She could finally sleep without feeling sick. What a great position to sleep in. But on Friday night, she started getting itchy. She had a bright red rash on the back of her neck and behind her ears. She kept trying to scratch it furiously. That night, she had a hard time sleeping yet again. She thrashed about in bed, because she couldn’t scratch the back of her neck. It was driving her crazy. We didn’t get a good night’s sleep again. The next day, her rash almost completely cleared up. We figure it was from sweat. Since then, she’s been pretty normal. Her usual cheerful self! She can’t seem to hold still for a good picture. There’s the butterfly she likes to the left. 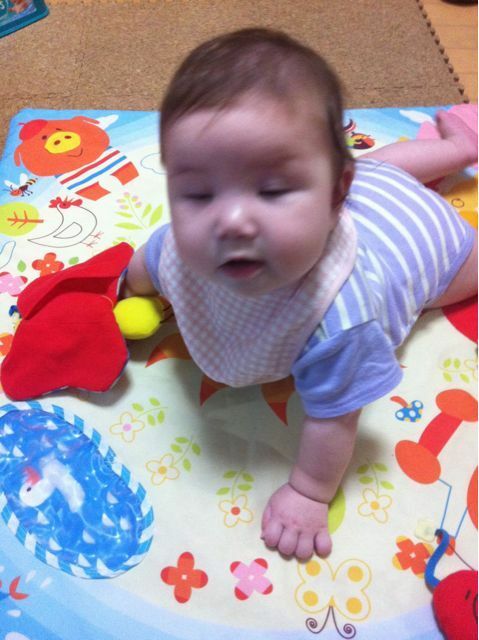 This entry was posted in Illness, Tomoe and tagged 5 months old, baby, fever, holding, itchiness, mobility, name, rash, sitting, solid food, teething, toys, vocalizing. Bookmark the permalink. ← What’s new at 5 months? Plenty!